I did not know that, Whynot. Still, the bins should be marked honestly for what they are. NOT dumped on our sidewalks as they please, perhaps placed at a gas station or lot. I like the idea of a real storefront collection where by the companies participate in the communities rather than trash it. I believe the rent would be prohibitive. I believe these stores are able to make money in high cost areas, mostly from the sale and donation of NON clothing items: Housewares, small appliances, etc. "Cool retro clothing" also is a money maker. ...but such clothing is a tiny % of what is going in the local faux charity bins. Well, if anyone has any large cotton sweaters they're thinking of giving away I would happily take them. I unravel these sweaters then warp up the cotton yarns onto my loom and make handwoven items like dishcloths, tea towels, and scarves. Denim or cotton bed sheets or curtains would also happily be of use in weaving rugs. I'm a little leery of thrift stores for the bug factor. And, Fulton and Franklin is nowhere near convenient for me and not near any trains I take. franklin and fulton are no way near me. Besides it would be difficult to carry a huge load on train, try carring up the stairs. For now I only go to salvation army thrift shop by nostrand when I rent a car, which is at least once a year. hmmm, last week there was a bin overflowing on Washington avenue across from botanic garden, right near the overpass of the Q train. i know someone that used to work for USAgain. he said that their business is so profitable that the bins are kind of a calculated casualty. They sell the clothes by the trailer. sometimes here sometimes down in Mexico, etc. and so by purchasing the trailer, you get a mixed bag if reselling to the public for profit. There might be gucci bags in one lot, but ragged clothes in another. The other side of their business is textile based. You know how upholstery and car seats have multi colored stuffing sometimes? That too is sold from what goes into the bins. So, if anyone here wants to donate items that they no longer want, please make sure you go to a reputable place that can give you a RECEIPT for your donation. edited to add, some of the bins are on the corner near a bodega or a parking lot of a bigger company, the bins pay monthly rent to those guys. i know someone that used to work for USAgain. he said that their business is so profitable that the bins are kind of a calculated casualty. They sell the clothes by the trailer. sometimes here sometimes down in Mexico, etc. and so by purchasing the trailer, you get a mixed bag if reselling to the public for profit. There might be gucci bags in one lot, but ragged clothes in another. I smell a reality show! I want to play the successful guy in black. The legit charities in the US (such as Goodwill) receive more clothing than they can sell locally. Once I tried to drop off a bunch of items left over from my (now) deceased parents to Goodwill (on Livingston) around the winter holiday season. The staff told me up front that they didn't really have room for donations that that moment in time. Both Goodwill locations are a little bit of a schelp for me. The journey to the one on Franklin is easier if you are carrying the items in a cart because it is 1) steps from the train station and 2) there is an elevator there. Can't say the same regarding the location on Livingston Street. ETA: The one by the new TD Bank on Bedford Avenue was moved onto the sidewalk on Sullivan Place during construction. I want to send in a notice to DSNY but I wonder whether it will do any good. Also, the unit on Sullivan Place behind that building that will be a new Walgreens is still there. The area has been fenced off, but people are still apparently dumping clothes there. Some of it is even getting caught on the top of the fence. I wonder how to proceed. I find it outrageous that the only way of reporting it in this day and age is via U.S. mail. Really? wish i had my camera. Saw a sanitation truck picking up 3 clothing bins along Washington AveTand Atlantic this morning. Would like to be able to share this moment. They did it the hard way though with a hydraulic cable and dragged it onto truck. they need a fork lift. I can't be the only one who has concluded this thread has made it really obvious why these bins are proliferating. Next in neighborhood Bingo, who had Bayside Queens:? Someone wasn't happy about the pink bin on Park between Classon and Washington, since I saw it knocked over this morning. How light are these things that someone tipped it over? Newguy posted a photo of that bin on the prior page. The bins are quite heavy, and without the use of equipment, very difficult to move as far as the street. A pallet jack (discussed above) is problematic in terms of availability and discreetness. However, one could flip the bin onto a really well made furniture dolly, move it, and then dump it in a nearby space on the street. And thusly was the legend born of El Carneviento, mad tipper of outlaw donation bins. I believe three people would be needed to tip a bin onto a well made furniture dolly. If the tippers were intoxicated, it might take between two and sixteen people. I am only responsible for my own behavior on July 17th, and every other day. i like it. bin-tipping will be the urban version of cow-tipping. How much might one of these bins fetch at a scrap metal yard? Asking for a hypothetical friend. The bins are made of steel, which is only worth $0.06 - $0.12 a pound. I'd estimate an empty bin to be about 500 lbs., so you'd get about $30 (500 x $0.06) at one of the local scrap yards. My hope is that Sanitation sells them for scrap (as opposed to selling them to someone who just puts them back out on the street). As a result, I suspect Sanitation spends far more money retrieving bins than it gets back. However, it has big drawback in terms of convenience: The bins sit inside a building. Space is valuable and people who don't live in the building have no access to it. The program does, however, potentially reduce the number of bins entities like Viltex find profitable to place around. BTW, can I get readers to post the locations of bins that have already been tagged by Sanitation, and are awaiting removal? there is a bin on Prospect place and nostrand that had its Sanitation tag and crayon numbers covered by a poster so there it still sits 2 months later. "Summonses are not issued, a department spokeswoman explained, based on the theory that those distributing the bins have factored any fines into the cost of doing business." "Once found by Sanitation Department enforcement officers or reported by residents to the city’s 311 help line, an illegal bin is tagged and the owner has 30 days to remove it." 2. Someone complains about bin. 3. Sanitation tags the bin. 4. Over the course of the next 30 days, the tag may be removed by the company, or the bin moved. 5. If the bin remains, Sanitation can remove it. However, Sanitation doesn't know that it is still there. Seems like its up to the citizens to make this business model 'tedious' for the shady companies that drop them. Article about these bins appears in today's NY Times. Jeffery is quicker than you, Capt. Yep. A terrible and dumb response. Punishes us all (occupying FDNY resources) instead of just the companies doing this. I would like readers help in getting the locations of nearby bins. I need the location of at least 8 already-tagged bins, for a -um- project. PM me or post locations on this thread. Thanks. I saw a bin on Atlantic between the Armory at Bedford and the adjoining auto repair shop that has a sticker partly pulled off. This plus the one I mentioned before at Nostrand and Prospct gives you 2 for your list, whynot. 1. Atlantic between the Armory and Bedford. How can you tell where the property line is? I was thinking about walking into TD Bank and ask whether the employees know where its property line is. For now, just worry about the bins that are already tagged. But a quick and dirty way determine the property line is to look at the fence line in either direction. Sidewalk cafes, trash cans, etc. all are supposed to be within the line. Seriously, the fence is not often the property line. The city often owns right up to the first step of house and even has right to remove a stoop if they want to widen street. So the fence is just an allowed curtesy of the city. I have seen this to be true on my own properties and confirmed it with HPD. In one case the fence is over a 100 years old yet sits four feet on city property! Every property is unique to the survey. The city won't inforce a missplaced fence until it is reported or becomes issue. Cafes have to keep 8 feet of sidewalk from curb clear. As a rule of thumb, the city has 15 feet from the curb. As @Dawndew noted, quite often, stoops and fences are on city property, particularly on residential streets. And this lack of clarity is yet another obstacle which makes it difficult for the city to tag and remove the bins. If they were placed on the street, Sanitation's work would be much easier. However, we cannot just put anything infront of our houses even if it is within your property line. These faux charity bins are in fact a commercial enterprise and perhaps not allowed on a residential front yard or sidewalk. I would be happy if the city merely took action against the ones that have been tagged, yet remain in place for more than 30 days. The NYT article also referenced fines being possible, yet not issued. I assume that the fines could only be issued after 30 days as well. Whynot, Did you see the bin on St mark's at Rogers with tickets? That is now number 5. 6. On St Marks, near Bedford. a huge load on train, try carring up the stairs. Saw a pink one on Carroll near Troy today. @rmaniac - Does your home subway station not have elevators? There was a pink bin on Franklin between Sullivan Place and Montgomery Street. I was going to take down its information yesterday when I noticed that it had disappeared. Weird. mugofmead, the German Hat Trick wins again. Not that Germans are to blame but the hat trick is effective. I am still wondering why the city takes so long. As far as a 'registered' car goes I can understand that the car belongs to someone. But these boxes are not registered, they are just sitting there with lies and false claims printed on them. What is stopping the city from collecting them ASAP. What possible regulation could be stopping them. If my car is parked on the sidewalk it would be towed within the hour. If I had dumped construction debri such as cinder blocks on the sidewalk they would be removed or the owner of the land it is in front of would be ticketed for not maintaining sidewalk. These faux bins I am guessing are even making the city skitish that they may in fact be church charities? But haven't we all proven that they are not already? Why do we need a law to do the job of cleaning? because the city can charge hundreds in fines, and people want their cars. Removing the bins certainly costs the city far more than they are able to recoup. This bin is on Franklin Avenue near the old Sea Crest site. Above, I counted it as number 4. I haven't seen the big "STOP DO NOT PLACE ITEMS IN THIS BIN" sticker obstructing the chute before. I am glad Sanitation is using these stickers while they sit waiting for pick up. Wow, those stickers need to find their way onto all of the bins. That article makes some good points, and I have no problem with the bin companies that clearly state they are For Profit and put their bins on private property with the owners permission. USAgain appears to be doing that at the car wash at Bedford and EP. Today I am proud to announce that I will be co-sponsoring legislation in the City Council that will empower the Department of Sanitation to immediately remove fraudulent for-profit clothing collection bins that have littered our public streets. This aggressive bill will impose stiff penalties on companies engaged in this illegal practice and will ensure New Yorkers can fully enjoy our City’s sidewalks. This legislative accomplishment would not have been possible without the relentless community advocacy of residents and organizations in neighborhoods like Sunset Park and Red Hook that ensured the full scope of the problem was well documented and reported to my Office, the local Community Boards, and the Department of Sanitation. Residents from across the district helped shape the final bill by pointing to regulations hindering the City from taking immediate action that we have addressed in the local law we will introduce. Community-driven bills like this set an example for the kind of legislative work that you should expect from my Office. It looks like the system works! On a related note, old clothes are piling up by the clothing donation container behind the former grounds of the laundromat that is on Empire Boulevard and McKeever Place. The bin is behind a chain link fence, so people cannot access it directly. So, people apparently have been throwing clothes & other items over the fence. Some of the stuff doesn't even clear the top of the fence; it gets stuck. It's becoming an eyesore, and I have no idea when construction is going to start on the new Walgreens. What are my options? I don't think reporting it to 311 as "dumping" would be effective since I've never witnessed this as it is happening. There is a sickening pile under the Shuttle overpass on Prospect b/w Franklin and Classon. I wonder if some people leave their clothing donations beside the bin (instead of inside them), with the thought that those who need clothing will use it. ...not realizing that the chance of the local homeless/poor person being a "good match" for their donation is almost zero. This morning I saw that the bin at Washington and Sullivan has also been tagged. The bin by 1548 Bedford Avenue (the former gas station near Eastern Parkway) has also been tagged. So if you don't want to haul your clothes to Goodwill on Fulton, and don't want to donate them to scumbags, there's another option. This bin has been removed. Any others in the area? "Legislation introduced by Councilman Vincent Gentile that would give the boot to illegal clothing donation bins on city property now has the backing of the mayor and several of the pol’s Council colleagues, setting it up for swift passage." 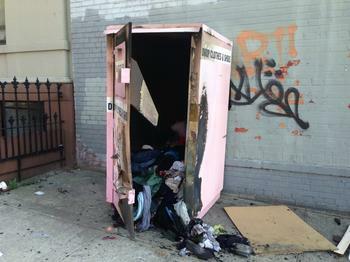 "The bill will authorize the Department of Sanitation to immediately remove clothing donation bins illegally placed on public property. It also gives the agency the power to issue a $250 fine to first-time violators and $500 fines for repeat offenders." Sounds like a much needed law to me. Man, would I love to have a small plot of land I could rent to a for-profit or non-for-profit donation bin. ...if passed and enforced, these new laws are going to make such companies desperate for such plots and pay well. Maybe they will resort to designing vans with the same access door but instead of on the sidewalk they are 'parked' on the street and move around to collect clothes. that seems acceptable. You mean like this @whynot_31? accually that is illegal too, even if on private property, You cannot just build an extension business to your residential house even as a bin. The new laws encourage this practice, whether it is legal or not. DOB has too many other things to do to worry about it. The bin at Bedford and Sullivan by the TD Bank is still there. The bin on Lincoln Road and Washington (next to Papa and Sons) has been tagged. I have seen those around. I suspect it is in response to having a bin removed being a real possibility. They also look like they'd be easier than the metal ones for a few people to move onto the street, where sanitation can PRESENTLY remove debris without having to wait 30 days. The bin that was bolted to sidewalk with a fence around it at Park Pl and Nostrand is gone. They welded it to the fence....it now becomes a DOB violation. City Council will see if the can city fine and remove the bins on city property right away. This morning I noticed that another bin has replaced this one. ( I know I didn't see it on Saturday when I walked by the lot at 1 Sullivan Place) Yet, it's already been tagged. I will post pics when I can. There is also a bin on Sullivan and Franklin, not with tags though. the bin on Prospect and Nostrand was tagged twice but they are now buried under posters. Nice dodge. I read somewhere that people removing (or, in this case obscuring) the tags is a problem, but that the real problem is that Sanitation doesn't presently have the resources to remove all of the bins that are visibly tagged over 30 days ago. The bins are like tribbles. There were a couple of kids rolling dice under the shuttle tracks on Prospect Place the other day right where the old bin used to sit. It seems that the city is reclaiming the space and everything is back to its natural order. However, there is still a pile of (now soaked) clothes to mark where the bin once stood.. I am just glad that the city now struggles to remove clothing bins, as opposed to abandoned cars. I saw a pink one on the corner of Franklin and Atlantic this past Saturday night. Now cars are worth more to scrap dealers so you need not abandon it someone will pay for it and tow it. Now maybe the city should authorize scrap dealers to pick up the bins? I doubt the ones made from chip board have any value. Scrapers would leave those. Update: This bin is gone. bin at Nostrand and Prospect Place is gone after tickets were covered with posters. The Commissioner of Sanitation speaks before the city council re: new bill being considered.